The limestone industry thrived in midcoast Maine for about two centuries. After it was quarried, the stone was heated in kilns and converted to lime, an important ingredient in building construction. The industry reached such heights that the community of East Thomaston, with 80 limekilns on its waterfront, was renamed Rockland in the mid-1800s. Lime export combined with shipbuilding, fishing and fish processing, granite quarrying, ice harvesting, and steamship transportation to make Rockland’s spacious harbor one of the busiest on the Maine coast. The harbor was also an important place of refuge for vessels in times of storms and rough seas. To aid local navigation, a small lantern was placed at Jameson Point on the north side of the entrance to Rockland Harbor in 1827. An early attempt to build a structure to protect the harbor was carried out in 1832, when mason Jeremiah Berry, a mason, constructed a small wall across a portion of the harbor. Construction of a more substantial breakwater was deferred for several decades because of the high costs. In the meantime, lime manufacturers suffered occasional losses when high, storm-driven seas roared into their kiln sheds, sometimes causing fires. Left: An early beacon at the end of the breakwater. Courtesy of Shore Village Historical Society. 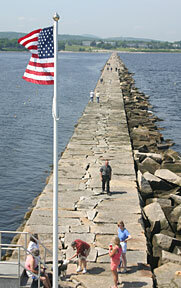 Between 1881 and 1899, a granite breakwater, almost a mile long, was built to help protect the harbor. The Bodwell Granite Company used around 700,000 tons of granite for the project, which cost more than three quarters of a million dollars. As the work progressed, a small moveable beacon was moved farther out each time the breakwater was extended. The light was relocated four times between 1888 and 1895. Charles Ames served as the light's attendant for some years at $25 per month. He also struck a metal triangle when a fog signal was called for. Ames usually walked to the light, but if the breakwater was covered with ice, he rowed out from Jameson Point. Finally, in June 1900, Congress appropriated $30,000 for a lighthouse and fog signal at the outer end of the breakwater. 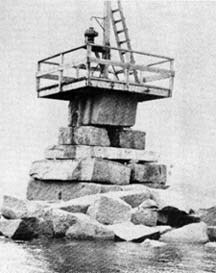 In June 1901, the beacon was moved to the extreme end of the breakwater to make room for the new station. At the lighthouse site, the breakwater is 65 feet deep, 43 feet wide at the top, and 175 feet wide at the bottom. The construction by the W. H. Glover Company of Rockland got under way on July 1, 1901, and continued through December 19. The work resumed in the following April and was completed by the fall, and the light, flashing white every five seconds, went into service on October 30, 1902. The station consisted of a one-and-one-half-story, gambrel-roofed, wood-frame keeper’s dwelling and attached brick fog signal building, surmounted by a 25-foot-tall, square, red brick tower. The interiors of the fog signal building and lighthouse tower were lined with ceramic-faced brick. The lantern held a rotating fourth-order Fresnel lens with a focal plane 39 feet above mean high water, and the fog signal was a first-class Daboll trumpet. A boathouse was attached to the north end of the pier. In the early years of the station, the fog signal was sounded as many as 900 hours during the year, or more than 10 percent of the time. A fog bell was later added as a backup. The first keeper was Howard P. Robbins, a veteran of 25 years at Mount Desert Rock Light, Blue Hill Bay Light, and Baker Island Light. Shortly after the station went into service, Robbins’s yearly pay was raised from $500 to $540. His son, Clifford M. Robbins, was appointed assistant keeper in November 1902. Right: Assistant Keeper Albert D. Mills and his father, Albert R. Mills, rowing a Lighthouse Service peapod boat. Albert R. Mills was a keeper at Goose Rocks Light. Courtesy of the American Lighthouse Foundation. This was a "stag" station, meaning the keeper's families did not live at the lighthouse. The keepers usually traveled by boat to Rockland Harbor, two miles away, rather than making the long trek over the breakwater. The keepers augmented their menu by trapping lobsters near the lighthouse. One former Coast Guardsman who was stationed at the lighthouse in 1951, Warren "Tommy" Ayres, told theBangor Daily News that the officer in charge once caught a 27-pound lobster. "The claw was as big as my shoe," remembered Ayres. Rockland Breakwater Light was automated in 1965 and the keepers were removed. The fourth-order Fresnel lens was also removed; its current whereabouts are unknown. The Coast Guard announced that they were going to destroy the structure. A public outcry led to the nearby Samoset Resort taking some responsibility for the upkeep of the building, after the City of Rockland turned down the property. In 1989, the resort relinquished its responsibilities for the lighthouse. Then, in 1998, the Rockland City Council applied for ownership of the property under the Maine Lights Program. The goal, said the Rockland City Council, is "to protect and preserve our own history to increase the access to this historic structure for our own citizens and visitors to the history of our region and that of the Breakwater Light." Rockland Breakwater Light is on Rockland's emblem and letterhead. The Maine Lighthouse Selection Committee approved the transfer of Rockland Breakwater Light to the City of Rockland in 1998. The Friends of the Rockland Breakwater Lighthouse, a chapter of the American Lighthouse Foundation, was established, and a lease was signed with the city in 2001. The group has been gradually restoring the building, inside and out. It was later renamed Friends of Rockland Harbor Lights to reflect the fact that the organization also now cares for Owls Head Lighthouse. In the summer of 1999, the exterior was scraped and repainted by volunteers, including sailors from a visiting U.S. Navy Destroyer, the U.S.S. Stump. A local Sherwin-Williams paint store donated paint for the refurbishing, and local restaurants provided food for the volunteers. A float and ramp were installed in August 2003. The Rockland Festival Committee donated the float, allowing easier access for both people working on the restoration as well as visitors who can't walk the breakwater. In the fall of 2003, EPI (Environmental Projects Inc.) of Gray, Maine prepared the interior of the lighthouse for restoration. EPI removed crumbling lathe and plaster as well as unnecessary conduit and piping. Also in the fall of 2003, a large, white painted mahogany bench was added to the boat deck of the lighthouse, providing a comfortable place for visitors to sit and soak in the view. Much additional restoration has been completed in recent years. The best views for photographing the lighthouse are from the water. The ferries from Rockland to Vinalhaven and North Haven pass close by, as do many excursion boats and schooners from Rockland, Camden and Rockport. Open houses are held at the lighthouse every Saturday and Sunday from the end of May to the middle of October. The walk to the lighthouse is a pleasant one on a nice day, but in rough weather waves sometimes lap over the granite blocks. The best views for photographing the lighthouse are from the water. The ferries from Rockland to Vinalhaven and North Haven pass close by, as do many excursion boats and schooners from Rockland, Camden and Rockport.